NVIDIA's GeForce 9600 GT looked like a winner at launch back in February. Then AMD waltzed up and slapped NVIDIA around with the Radeon HD 4800. Its effect was to push some very powerful 3D hardware below the £100 barrier. That's made life a lot harder for the plucky little 'GT. To counter this, Gigabyte has wheeled out this impressive factory overclocked revision. For starters, the core and shader clocks have been bumped from 650MHz and 1,650MHz respectively to 720MHz and 1,800MHz. Memory speeds are also up from 1.8GHz to 2GHz. 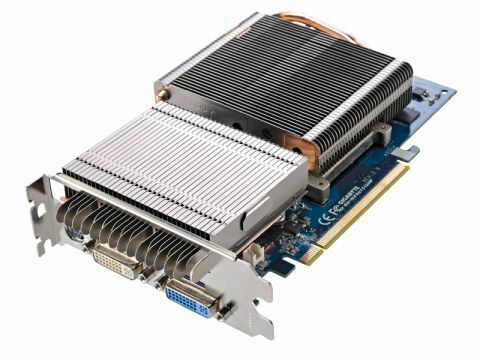 All of which makes this probably the quickest 9600 GT we've seen and comfortably faster than Sapphire's Radeon HD 4670. Factor in the well-engineered passive cooling and it's just about worth the extra 25 smackers.